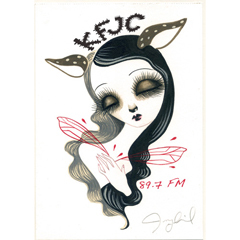 Jennybird Alcantara is an artist living in San Francisco, CA. where she received her BFA from the San Francisco Art Institute. Her fantastical works have a dreamlike narrative and through her paintings she contemplates the complex interconnectedness of opposites as seen through the prism of myth, fable and fantasy. Jennybird uses the symbolism of duality to explore the connection of life and death and the veil in between, as well as the relationship between the beauty and cruelness of nature. The anthropomorphic qualities in her characters show the relationship of the central figure to the world she inhabits. If you’re a girl, you wear a shirt and you want the latest KFJC t-shirt on your back – then you need this. We know you are thinking what if I am not a girl but I want one? Do it.